Samford University’s Department of Communication Sciences and Disorders recently hosted Pirate Camp for children ages 10–12 who have not yet refined their production of the “R” sound in traditional speech therapy sessions. 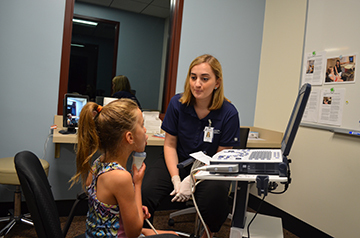 Incorporating leading-edge ultrasound technology and pirate-themed fun, Samford’s Pirate Camp offered a four-day therapeutic learning experience that benefited its campers along with Master of Science in Speech Language Pathology students. According to professor Carol Koch, R is one of the most difficult sounds to produce and teach. Using traditional observation methods, speech-language pathologists are unable to see the complex tongue and mouth positions required to produce the sound. This creates a challenge for therapists seeking to effectively correct clients who struggle with the R sound. Campers were greeted each day with a sign that said, “I do not want to hear the words ‘I can’t, impossible or cannot.’” Though the children were attending camp to address challenges with their speech, each was strongly encouraged to persevere and, above all, have fun. MadLibs, scavenger hunts and other games encouraged campers to use the R sound in fun and entertaining ways. The children participated in group activities in addition to attending individual ultrasound sessions, a treatment technique that the children had not experienced in previous speech therapy sessions. The camp was an “all hands on deck” experience as Master of Science in Speech Language Pathology students lead the camp under the direction of Koch and other faculty. Students facilitated the groups sessions and worked one-on-one with the children using the ultrasound technology. Students said they saw a noticeable difference in the speech of the children. As you might expect from a good pirate story, they all left with invaluable treasures in the end.